The tauren of Highmountain are devoted to the spirits of earth, river, and sky. After ages spent protecting their sacred mountain, they are now ready to venture out into the world beyond the Broken Isles. One of the new Allied Races coming in the Battle for Azeroth expansion, Highmountain Tauren NPCs were introduced in the Legion expansion, and had an entire zone, Highmountain, full of lore and quests. the Highmountain Tauren have Moose horns, as opposed to the more bovine horns of the original Tauren race. Note, Allied Races start at level 20, and with the new level scaling from 7.3.5, Highmountain Tauren can quest in any zone requiring a 10-60 level range, as long as said zone has Horde quests. Even the Lord of the Forest, Cenarius, recognized Huln's greatness. He bestowed him with a blessing that we carry with us to this day: the Horns of Eche'ro. Racials: Highmountain Tauren racials are earthy in nature and in line with their Tauren cousins. Bull Rush Bull Rush - Charges forward for 1 sec, knocking enemies down for 1.5 sec. 2 min CD. Pride of Ironhorn Pride of Ironhorn - Mining skill increased by 15 and allows you to mine faster. Mountaineer Mountaineer - Increases Versatility by 1%. Rugged Tenacity Rugged Tenacity - Reduces damage taken by 330. Waste Not, Want Not Waste Not. Want Not. - You have a chance to loot additional meat and fish. When an Allied Race is leveled from 20 to 110 (sans boost), the player gets Heritage of Highmountain, an achievement that unlocks a set of Heritage armor to use on that race for their account. Lady Highmountain Tauren in the Heritage gear in the wowhead Dressing Room! Trust me... I have experience at exploring deep places. My totem thunders. All. Night. Long. Beware the deep places... of my heart. Get as rough as you like. I've got a thick hide. You must be an alchemist, because we've got great chemistry. Why does that draenei couple keep asking me where Rocky is? Let's play a game. We take a drink every time a harpy screeches about earth and stone. I may be a simple tauren from the mountains, but at least I don't dig through worm dung for loot. Ha! A buddy of mine convinced this epic-geared adventurer to kick fish into the river! Oh wait... that wasn't you, was it? A tauren, a yaungol, and a taunka walk into a bar. This isn't a joke--it's my family reunion. What smells worse than a drogbar? Two drogbar. What smells worse than two drogbar? Nobody knows, because the stench will kill you. Did you just try to hang your hat on my antlers? What do I look like, a coat rack? Why settle for horns when you could have a rack like this? I'm forming a group of tauren demon hunters. We're called the Illi-dairy. Are you staring at my rack? It's not the size of the antlers. It's the motion of the totem. You know the way to a woman's heart? Hoof rubs. Trust me on this one, darling. You don't need to be from the Skyhorn tribe to join the mile high club. What do you get when you feed cocoa to a Highmountain tauren? Chocolate moose! Why are the Rivermane always so calm? Because they've learned to go with the flow. Brrrrr, it's cold in here. In the mood for some ice cream? Tauren make the best poets. Their verse is so moooooving. I know Ethel. She's actually a very fast walker. She just thinks it's funny to mess with tourists. Maybe you want a different moose mount for your moose-horned character? Maybe you want an aquatic mount (no moose here, sorry!)? Maybe you want a moose battle pet to follow your character? Highmountain Tauren intro (narrated by Mayla Highmountain): Highmountain stands. These words speak of more than earth and stone. They tell the history of our people, enduring hardship and conflict to unite against common foes. The time has come for you to venture beyond our sacred peaks. Walk the path that Huln took so very long ago, and bring honor to the name... Highmountain. An open letter to Wow devs and players alike. The Highmountain tauren "no moo emote" issue is a serious one. We dedicated tauren take issue with the lack of mooing. We have created a Change.org petition in the hope that Wow devs, especially Ion Hazzikostas, Alex Afrasiabi, and Chris Robinson will take notice and take action. It's understood that tauren aren't the most popular Horde race. It's also understood that most Alliance players couldn't care less whether the Highmountain tauren have a /moo emote. But this isn't a matter of fandom, furdom, lore, factions, fursonas, or even immersion. It's a simple case of giving players what they want--in this case, something that doesn't affect non-tauren players, doesn't detract from gameplay, and doesn't give tauren any type of advantage. This is neither trolling nor a joke. It is a serious petition asking for your serious attention. The most popular argument argument is: Highmountain tauren are more mooselike than cowlike. We understand this. It's a change from "standard" tauren to something different and new. But if that's the case, why do the Highmountain tauren make cow puns like their "standard" tauren brothers and sisters? Why should their outward mooselike appearance matter, when their hearts and spirits are bovine by nature? We submit that Highmountain tauren are indeed cows at heart. Yes, they appear more mooselike than cowlike, possessing antlers in place of the recognizable cow horns--but this small aesthetic difference doesn't change the fact that we are all tauren under the skin. You have taken the time and effort to create this new race. By pleasing your players and tauren supporters, it is a win-win situation. You will see the fruits of your labor pay off, and we tauren will be satisfied and happy...not to mention grateful that you heard our request and took action. We don't play tauren for their physical beauty, superior /silly feature, or stunning racial abilities. We play tauren because we love cows. Mooing is an inextricable aspect of the cow persona. It's part of what makes us who we are. It's an important part of our unique appeal. It's vital to our personalities and identities. We play in a world of demons and wizards and spacegoats and little veggie pets who fight in mini-battles with dragon whelps. We have flying cities, snarky imps, and Old Gods. We have wolf-people riding horses and cows riding dinosaurs. So the "realism" argument (i.e., "moose don't moo") is irrelevant. Do we play wow for a "realistic" experience, or do we play wow for a fun and immersive escape from drab reality? Give Highmountains the option to /moo, as well as something like /moose for players who wish to enjoy the moosier aspects of belonging to Moo-la Highmoo-ntain's tribe. If certain Highmountain tauren wish to /moose instead of /moo, that is their choice, and we support their decision. But give us the natural voices of our proud people. We appeal to your sense of social justice, fair play, and dedication to pleasing your loyal fans and players. Furthermore, we appeal to everyone...not just to tauren friends and co-players, but to ALL wow players, Alliance and Horde alike, who would be saddened by losing their beloved class or race individuality. Join with us. Stand with us. Support us in our cause. Especially if you have friends who love their cows, I humbly ask you to support our efforts to reclaim our race's special voice. This is a small thing to ask. It has no great bearing on gameplay or the world at large. It's simply a matter of a player demographic so dedicated to their cherished tauren who stand to lose so much from a seemingly insignificant change. It matters to us. This is an important issue that must be resolved. Sometimes the little things are the most vital. 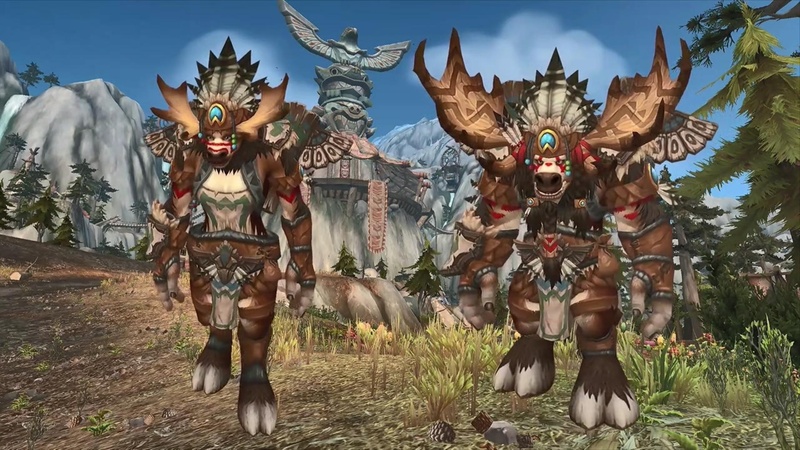 Wow devs, you'll lose nothing by giving us our /moo...and by doing so, you'll earn the respect and appreciation of an entire generation of tauren people. We look to you for the restoration of our people's ancient call. Unlike the Nightborne who start at Exalted with the Nightfallen, Highmountain Tauren start at Friendly with the Highmountain Tribe. This only allows you to wear the Bloodtotem War Harness, and prevents you from the other totem harnesses unfortunately, so one would have to grind all over again.